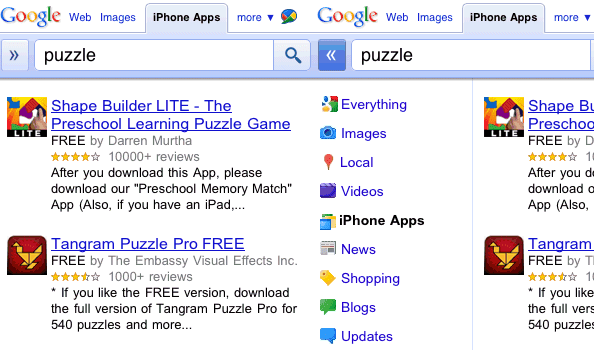 Google started to index Android and iOS apps in June, but the results were only displayed as part of an OneBox. Now you can select "Android apps" or "iPhone apps" from Google's sidebar and restrict the results to mobile apps from the Android Market or the Apple App Store. Obviously, this option is only available if you use an Android or an iOS device. Google uses a different way to rank applications than the app stores, so this feature could help users find new applications. Unfortunately, Google's snippets aren't always useful because they include the first sentences from the descriptions, which are sometimes used to announce new features or promote other applications. I see the Android Apps tab in my Droid Incredible 2.2 Froyo it works perfect in Dolphin browser. Awesome. I noticed this this morning on my G2, but it didn't stand out for some reason. This doesn't seem to be open to the pubic and/or available worldwide yet. I've tried lots of combinations here, but can't see these pages. I am living in Spain and I have an HTC Desire with Froyo updated via OTA. I can't see this features in my default web browser. Is there any configuration that should be activated or changed? Do it works with the "mobile" user agent or it also works with computer user agent? This is US and GB only right now, as is the related onebox feature. I had this a while ago, but it disappeared some time yesterday night.